Abilities: Able to feed on blood to regenerate. 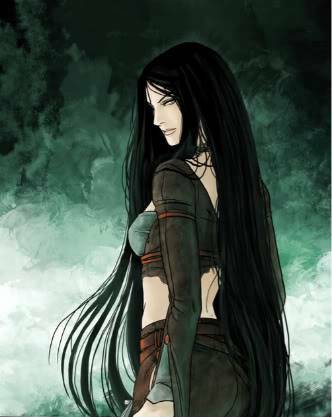 Description: Long, straight black hair flows free from her head down to her waist, framing a fair and gently smiling face. Her facial features are smooth and fine, pale but unmarked. She's obviously well taken care of, clean and neat, detesting the use of makeup. Set into her eyes are two silvery pupils, bright and sometimes very expressive. Though Lucrecia has become more adept at hiding emotion, her face can show it when she's off guard. Lucrecia stands at a model height, sporting a slim and slender physique with no prominent muscular features. Despite her true age, she looks to be not a day over 20 years old, a youthful yet adult appearance. Her body is very feminine, curved and finely shaped. Every ounce of her weight is properly distributed, showing a love for maintaining health. From her slender neck and her fine hands to her thin waist and toned core. Her skin tone is pale, a racial trait that most mistake for simple fairness. There are no visible scars or blemishes, nor tattoos. All in all, nobody but the most trained senses or mages, or one of vampire kind could discern her nature from appearance alone. Personality: Lucrecia is a fairly down to earth person. She's had a real interesting history to be sure, but she manages to keep things simple and positive. In public, she's outgoing, friendly and charming, as she's been for years. She can be flirtatious, too, should she be interested in someone, or sweet and kind. But like any mortal humanoid, she can get upset. While she does her best to keep things calm and collected, if someone pushes her far enough, Lucrecia's anger might prove dangerous. Its not often that such a situation happens though. Lucrecia's views on morality aren't very straight, personally shaped by her experiences in life. She doesn't like the murder of innocents, but believes that those who deserve such a fate are justified to be assassinated. On a less violent note, she also believed that the rich, snobby nobles coud stand to be robbed every now and then to support the less fortunate. Lucrecia Grey was born into a most strange situation, out of a unique romance with a dramatic ending. It all started with a simple desire for something more... Boredom of undeath by her Vampire father. It came to pass that he greatly desired a young gypsy woman, and at the urging of a strange Gypsy seeress, he persued her. As the handsome vampire tried to charm the beauty, he realized that it was more than lust. There was something to the living creature he found that made him feel... Peacefully mortal. She eventually fell to his advances, despite knowing his true nature. But beneath the charming personality was a hidden and unstable monstrosity. The vampire lord was overly protective of his prize, and had no qualms about murder. And unfortunately, all of his kind harbored a hungry lust for blood. In an attempt to protect the woman from nearby bandits, he slaughtered a whole camp of them. That very night, he took his love to bed. The gypsy had no knowledge of the massacre that occured before their pairing, the blood that the vampire had gorged himself on would produce a result neither of them could have ever imagined. The seeress kept silent, knowing very well how all events would turn out, one after another. When the gypsy woman found herself with child, she was initially distraught and confused. She had not lain with any other and thought fertility with a vampire was impossible. The vampire himself was suspicious of her strange mood and behavior, until she broke down and told him. Seeing the truth in her eyes, he investigated the matter, only to discover the rare way to produce a child from such a pairing. The vampire then declared that they were blessed, that the baby was a gift to them that they would have to protect and nurture. All was well for some time, despite the woman's pregnancy being taxing on her. The nearby village however, was not so pleased. Word got to them that the gypsy carried an abomination and organized to end it. They stormed the Gypsy camp, but did not find the woman or the vampire. He had already brought her to his manor in order to watch over her. A gypsy boy gave in to their demands and told them where the couple would be. That day, the woman went into labor. The vampire was able to rise just in time for the baby's birth during the night, dismissing the mob before the estate's walls as a lesser priority. He only had the assistance of the very seeress he had trusted before. Finally, Lucrecia was born, but with a price. The mother perished less than an hour after the child's first cries, despite the elder gypy's effort to save her life. After declaring her daughter's name, the gypsy became cold and lifeless. The vampire grew unstable, his loss awakening emotions of utter pain and rage, turning the blame on the mob outside. He convinced himself that they were responsible, that their threat had stressed his love in birth and weakened her so fatally. Leaving the babe in the care of the elder gypsy, the enraged vampire burst open the doors to the estate. Such a powerful, hateful presence made the gathered villagers move back in fear. Intent on slaughtering them all, hoping for some kind of justice, the vampire attacked. It was a bloody night, leaving the next morning littered with corpses, a dreadful feeling of sorrow and loss in the foggy air. When the vampire's rage had calmed, he mourned. He was too pained to take Lucrecia on as his own, and with few survivors of the mob left to blame, he turned in on himself. He could not protect the one creature precious to him, how could he keep his daughter safe? He charged the elder gypsy to adopt the baby, who agreed and left, while the sorrowful vampire shut himself away in the bowels of the estate. After that, the years began to roll by. The incident became a horror story among the villagers, the estate was deemed haunted and unholy, falling into ruin with it's master dormant. The gypsies migrated and raised Lucrecia as one of their own, keeping the truth of her nature from her until they thought she was old enough to understand. The girl took it well, and understood that she should not dwell on the burned past and her racial heritage. Lucrecia turned 19 before she decided to leave the gypsies and set out to find her calling. She was sure that such a life no longer suited her, that she might be destined for something greater. Following her desire for adventure, the young woman travelled far. She eventually ended up in a gang of highwaymen by odd circumstance, learning less 'noble' skills and becoming a bit of a fighter. While she had little physical prowess, Lucrecia excelled in stealth and thievery. She became handy with short blades and earned a little reputation with her gang. While Lucrecia enjoyed her company and the things they graciously taught her, she knew that eventually it would be time to move on. This came sooner than she thought it might when her gang had been scattered and hunted down by a rival group. Forced to travel again and start over, Lucrecia ended up in the Evereska area. There she met another group of skilled hands that operated against the law, though they were much more efficient, clever, and dangerous. Lucrecia's own skills progressed as she spent time with them, robbing nobles' homes and distributing excess wealth to needy families. Though over time Lucrecia began to notice some things about the group that bothered her. Some had no second thoughts about having to assassinate people in order to get smething done. She ended up doing things she wasn't proud of, which eventually led to her leaving. 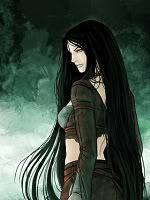 Determined to start anew once more, Lucrecia set out for Baldur's Gate, though it wasn't to be her ending destinaton. She thought perhaps it would be best to set out on the ocean and settle on one of the island settlements off the Sword Coast. But Lucrecia stayed in Baldur's Gate for a time, bartending at a fairly classy tavern until she had an idea. Lucrecia developed a persona, a masked vigilante identity that the people of Baldur's Gate came to call 'The Night Wraith', who ran free among the city after dark, stealing from the rich and giving to the poor. She also saved a few lives on occasion, including her own from thugs and lawmen. This went on for a good few years before her identity was at risk. Lucrecia had fallen in love with a Tiefling mercenary known as Rohera Geslat, who had bandaged her and nursed her to health one accidental night from a bolt to the arm. It was after Rohera and Lucrecia became lovers that a woman, jealous of their relationship began to spy on them. Known as Adeline Reed, this woman had long sought the heart of Rohera, despite his spurning of her affection. She came to Rohera, threatening to reveal what she had learned of Lucrecia's nightly persona if he did not leave her. It was a difficult decision, and Rohera would not endanger his lover if he could help it. He was pained to tell a confused and heartbroken Lucrecia that he could not stay with her. Unable to explain to her the truth, he could only hint and beg for her to leave the city for her safety. Distraught and in tears... She did. Lucrecia abandoned her home, her masked indentity and all she could not carry along with her, leaving on a boat for the sea. But fate carried her not only to a place to begin anew, but to a place where she and many others would fight daily for their very survival... A place to make a difference in a life other than her own. The ship that bore Lucrecia, bound for an isle somewhere off the Sword Coast had been dragged into a vicious gale one night at sea, drawing it close to the borders of Siranda. Before the crew knew it, the ship was crashed onto the cursed isle's shores, leaving few survivors. Lucrecia managed to live, but had made a difficult choice in order to do so. She fed off of a single living crew member, wounded fatally and slowly dying. In a wild haze and a will to live, Lucrecia made her way from the beach into the woods, all the way to Kalaram. There she would find the other survivors, long time and short time inhabitants of the place in one way or another. She grew to know the isle better, helped to equip herself with better gear and weapons, know the people she was surrounded by. And shockingly enough, Lucrecia again found love in her heart with the most unusual of all figures, a vampire named Alexander. And that is where her story continues.